If 14-year-old Claire knew I was now making my own deodorant she’d be appalled. There was a day when I couldn’t get enough of the aluminum-based stuff. I’d reapply at least six times a day, worried that there wasn’t enough I could possibly do to cover up the smell of being human. I was definitely the girl who walked around with powdered deodorant balls falling out of her t-shirt and onto the floor. I was tragic. I’m still wickedly hypersensitive to smells, but my fear of chemicals in products has started to outweigh the stink factor. For the last few years I’ve been using natural deodorants and have tried many different brands — Tom’s, Burt’s Bees, Weleda and others — but always with unimpressive results. I’ve been wanting to try making my own for a while, but never quite got around to it until recently when I opened the bathroom cabinet and realized I was completely out. And so I returned to my search for the perfect DIY recipe with renewed focus and ultimately used Angry Chicken’s recipe as my jumping point, modifying it to the products I had on hand. Instead of a cream deodorant, like Angry Chicken’s, I conveniently wound up with a glide deodorant. It’s pretty easy and pretty fun. I’m loving the scent of the gentle, warm citrus blend below, but you could absolutely experiment with other essential oils. 1. 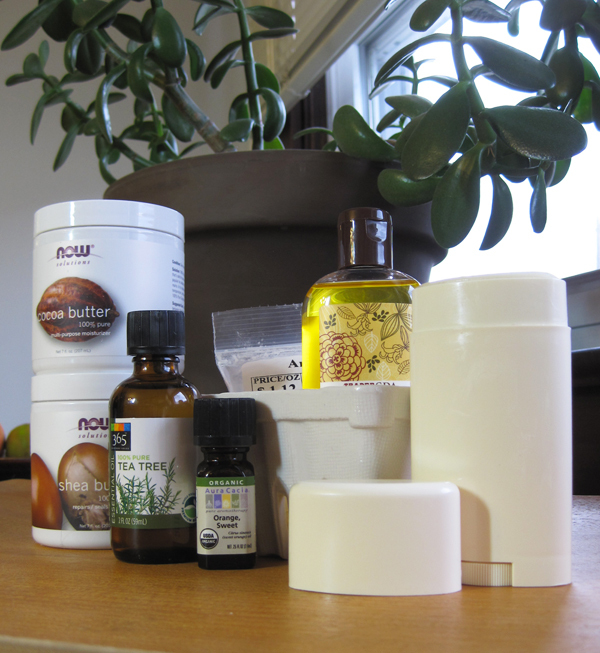 In a double boiler mix Shea Butter, Baking Soda, Arrowroot Powder and Cocoa Butter until well mixed. 2. Remove from heat and let cool just a bit. 3. Once slightly cooled, add Jojoba, Sweet Orange and Tea Tree oils, mixing thoroughly. 4. Pour contents into a an old deodorant tube. I cleaned an old Tom’s deodorant tube and filled that. If you don’t have a tube on hand, you can easily use a small, 4 – 6 oz. glass container but will have to apply with your fingers instead. 5. Once poured into the appropriate container, place in refrigerator to set. Once solid, store at room temperature. To apply: If using as a glide deodorant, you know the drill. You may have to loosen the stick of deodorant from the sides of the container for your first application by warming the plastic in your hands and gently pressing the plastic all the way around before turning the dial. Otherwise, you should be set. If you didn’t have a tube and poured your deodorant into the glass container, simply rub your fingers briskly on the surface of the deodorant. It will melt into a cream and you will want to use about a pea-sized amount to rub into each armpit. I’ve used it both ways and both work, but the glide deodorant fits my morning routine best. * Please note that this is a deodorant, not an antiperspirant. It’s not going to prevent any heavy sweating, but it’s at least going to combat the stink. And even though it’s not an antiperspirant I’ve already found it keeps me drier than some of the natural, glossier deodorant brands I have used in the past. I really like the results so far and, as my husband can confirm, I’ve been walking around the house smelling my armpits every few hours just to make sure. Believe me, I’d let you know if I wasn’t smelling fresh. I’m surprised homemade deo doesn’t have talc in it at all? Also, I am interested to hear your experience of underarm staining — I stopped using “clear” deodorants forever ago because they were damaging my clothes. Seems these oils could also cause buildup? Do report back! I’d love to travel back in time and taunt us as kids. I’d also really like to be able to read some of the articles we wrote for the Camp Miller newspaper. I bet they were a fun reflection of who we were. The arrowroot powder in the deodorant is a replacement for talc, actually, but without the debatable cancerous associations. As for the deodorant staining, I’ll keep you posted. So far I’ve not noticed any trouble with it. But I, like you, had a slew of my favorite tops ruined by the clear stuff when I used to used it. Laughing out loud at the 14 year old Claire. Yes I can attest to the obsession…One of the funny Claire moments making sure we don’t stink at camp…really we all stunk but you! Love ya! Love that you remember this. I also have distinct memories of always using your fake “White Diamonds” body spray. All the time. Even when we were just going to the farm. I really owe you a canister of perfumed spray from like 1991.